Empress of the Seas was one of Royal Caribbean International's first cruise ships and the smallest at an intimate 48,563-ton, 1,602-guest capacity. 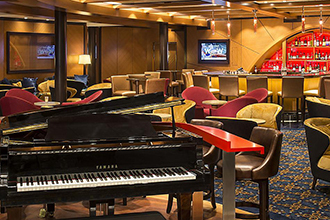 Always a crowd-pleaser, she is better than ever after an extensive $50-million refurbishment in 2016. 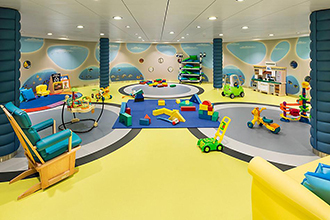 Enticing enhancements include new pools, a Cuban-themed lounge, a rock-climbing wall, three whirlpools, the adults-only Solarium and VOOM, dubbed the fastest internet at sea. Guests will enjoy Broadway-style shows, five bars and lounges, the revamped world-class casino, duty-free shopping, complimentary entertainment and live music, plus longer stays in port. 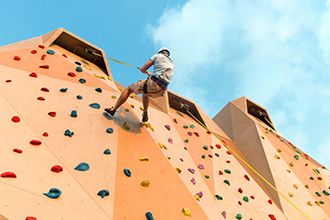 Signature Royal Caribbean amenities also include the complimentary Adventure Ocean youth program ensuring a fun and memorable family vacation for all ages. 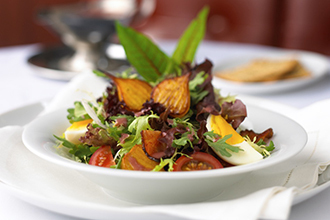 Delicious dining options include the casual Windjammer Café and the line's signature steakhouse, Chops Grille along with an elegant main dining room. Enjoy leisurely Sunday Brunches — everyday — along with a complimentary mimosa or Bloody Mary. 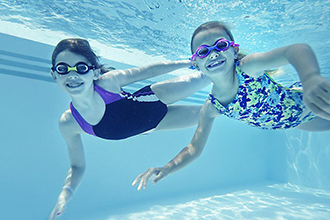 Soak in the sun while enjoying the fun at pool parties. 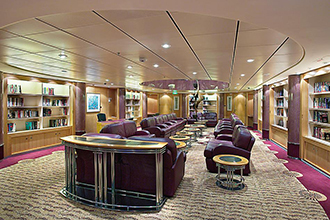 Choose from a wide selection of comfortable staterooms, ranging from balcony suites to interior. Book pampering treatments and services at the Vitality Spa and don't miss a work out at the state-of-the-art fitness center. 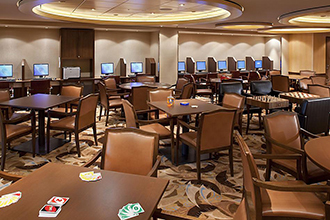 Updates on Empress of the Seas include a wide range of renovated staterooms — from balcony suites to interior options. 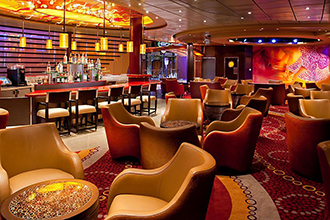 Royal Caribbean International's signature Viking Crown Lounge is the perfect location to engage in great conversation. Watch thrilling Las Vegas-style entertainment, such as "Sequins & Feathers." 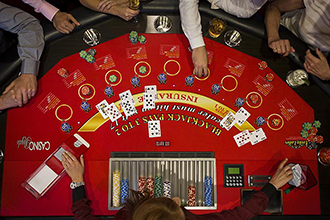 Try your luck at the bustling and beautiful Casino Royale. The evenings are alight with excitement at Boleros Latin Lounge which is the perfect venue to spice things up with margaritas, tequilas and mojitos as well as dancing the night away to live salsa and meringue. 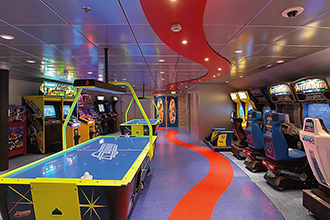 Ideal for first-time cruisers, families and groups, travelers who prefer a smaller ship and those looking for a cost-effective vacation will find this and much more on Empress of the Seas. 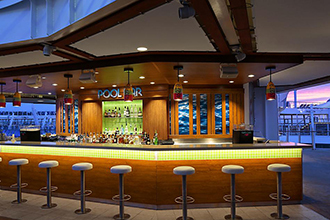 Experience this charming cruise ship for yourself and see why she is a long-time favorite of Royal Caribbean cruisers. 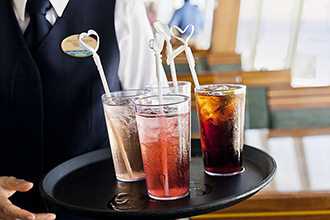 Cruise on Empress of the Seas to the beautiful Bahamas and Caribbean islands. 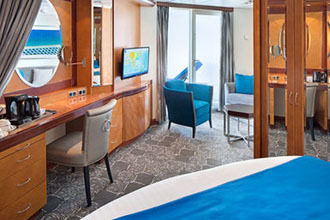 These staterooms offer a gorgeous view, two twin beds and a private bathroom. 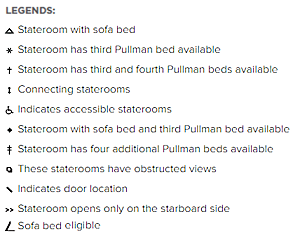 Beds-Two twin beds that convert to Royal King, Two Pullman beds or bunk beds in staterooms with up to 4 guests. Size-Stateroom: 139 sq. ft. 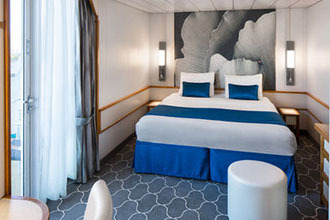 This standard stateroom offers two twin beds, a private bath and all the amenities of our standard staterooms. Beds-Two twin beds that convert to Royal King, Two Pullman beds in staterooms with up to 4 guests. Size-Stateroom: 117 sq. ft. 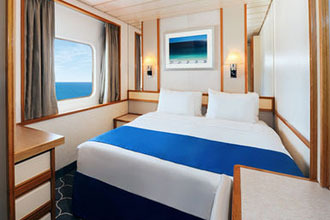 These staterooms offer a gorgeous view, two twin beds and a private bathroom. Beds-Two twin beds that convert to Royal King, Two Pullman beds or bunk beds in staterooms with up to 4 guests. Size-Stateroom: 139 sq. 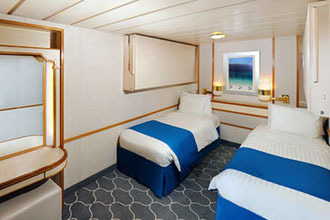 ft. Accessible-These staterooms offer a gorgeous view, two twin beds and a private bathroom. Beds-Two twin beds that convert to Royal King. Size-Stateroom: 144 sq. ft. 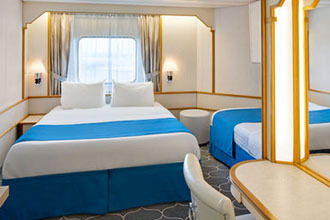 These staterooms offer a gorgeous view, a Royal King bed and a private bathroom. Beds- Two twin beds that convert to Royal King. Size-Stateroom: 108 sq. ft. This standard stateroom offers two twin beds, a private bath and all the amenities of our standard staterooms. Beds-Two twin beds that convert to Royal King, Two Pullman beds in staterooms with up to 4 guests. Size-Stateroom: 117 sq. ft. Accessible-This standard stateroom offers two twin beds, a private bath and all the amenities of our standard staterooms. Beds-Two twin beds that convert to Royal King. Size-Stateroom: 117 sq. ft. These suites offer a comfortable bedroom, small sitting area and a private balcony. Beds-Two twin beds that convert to Royal King, One single sofa bed in staterooms with up to 3 guests. Size-Staterooms: 225 sq. ft. Balcony: 40 sq. ft. These suites offer a comfortable bedroom, small sitting area and a private balcony. Beds-Two twin beds that convert to Royal King, One single sofa bed in staterooms with up to 3 guests. Size-Staterooms: 225 sq. ft.Balcony: 40 sq. ft. These luxurious suites offer separate living area, private balcony and a mini bar. Beds- Two twin beds that convert to Royal King, One single sofa bed in staterooms with up to 3 guests, One double sofa bed in staterooms with up to 4 guests. Size-Stateroom: 272 sq. ft.Balcony: 140 sq. 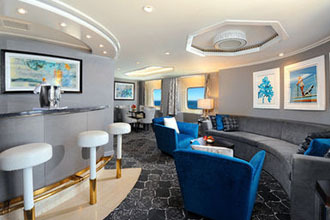 ft.
Our Royal Suite offers a separate bedroom, balcony, whirlpool bathtub and wet bar. Beds-Two twin beds that convert to Royal King. Size- Stateroom: 508 sq. ft.Balcony: 161 sq. ft. Nighttime sizzles at Boleros, a Latin-themed club and hot spot. Try a variety of specialty drinks inspired by the music— like Cuban mojitos and Brazilian caipirinhas— and get down to the pulsating live music with a six-piece Latin band. This is one after-dinner party you don't want to miss. Have a portrait taken in our photo studio. A great memento for families and couples. 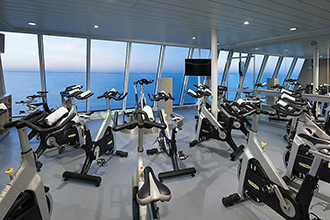 Our seaside fitness center features modern exercise equipment. Our full-service spa offers a beauty salon and spa treatments, including massage, manicures and seaweed body wraps. No day at the pool is complete without an ice-cold beer or cocktail to cool off.